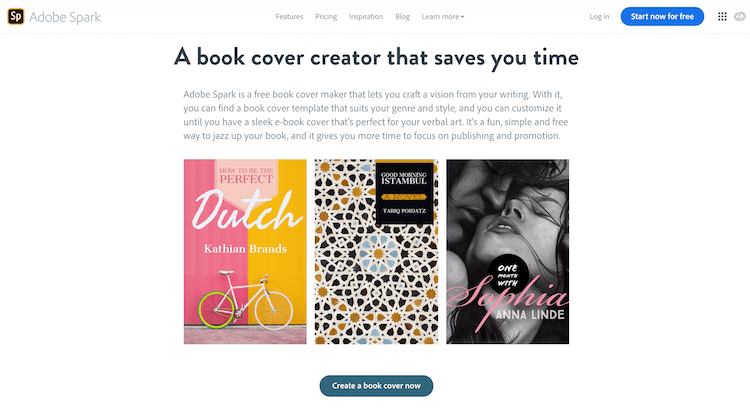 Are You Looking For A Free Book Cover Creator For Your Book? Hiring a designer to produce a professionally designed book cover that will be unique is always highly recommended, but it is expensive. For a print book, a high-resolution professional book cover image is a must if you want a beautiful book. So you almost always need a professional graphic designer to help you. But for an ebook, the specifications are not as stringent. Amazon KDP recommends that the ideal size for a Kindle cover is 2,560 x 1,600 pixels. There are many possibilities to create a design if you want to know how to make a book cover for free. You can make book covers online that are eye-catching. Most sites that offer a free online book cover maker usually have a paid option as well. Prices vary, so you will need to decide if the options will provide you with more value over designing a cover for free. Another use for a cover creator is to make a few different versions and designs and then ask people what they think. This is a clever little marketing ploy you could use before you publish your book to attract interest before your book goes on sale. As with almost anything that is free, expect that you will need to provide your email address and get some junk mail. Well, nothing is really free anymore. 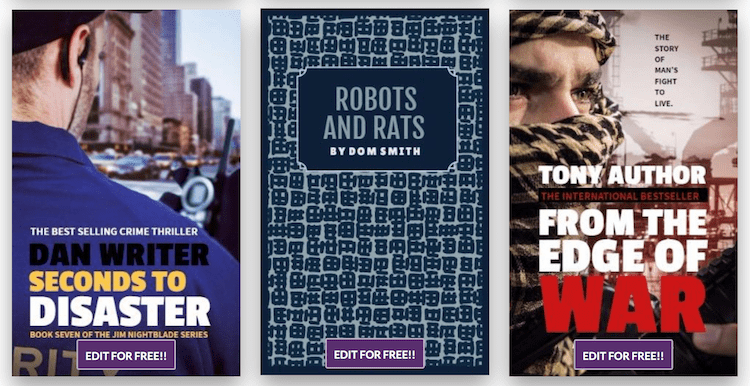 But the six book cover maker sites below are well worth trying if you want basic design tools and images effects to create a quick ebook cover. Poster My Wall is a graphic design site for all types of posters and flyers. But it has a great selection of cover design templates for Kindle ebooks. You don’t need an account so you can jump right in and start designing. This is why I have listed it in first place. The easiest way to get started is to type “Book Cover” in the search box, and you will hundreds of template choices. 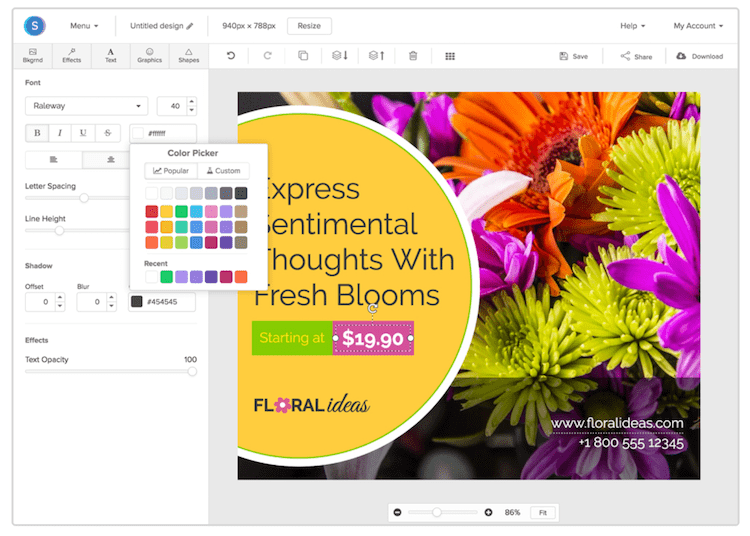 Once you select a template, you can modify it in the editor by changing text, colors and fonts. It is a quick and easy way to make and download a book cover for free in only a few minutes. Anything called Adobe is probably going to be good at book cover design. You will have to create an account before you start using it, but it is free to do so. There are quite a few restrictions however if you opt for the free version. The features listed below are only available if you pay for a monthly subscription. Canva is a great allrounder graphic designing suite of tools for things such as gift certificates, brochures, headers or business cards. I use it a lot for creating unique blog images. But it also has a lot of templates for you to make eye-catching book covers. You will need to create a free account first. 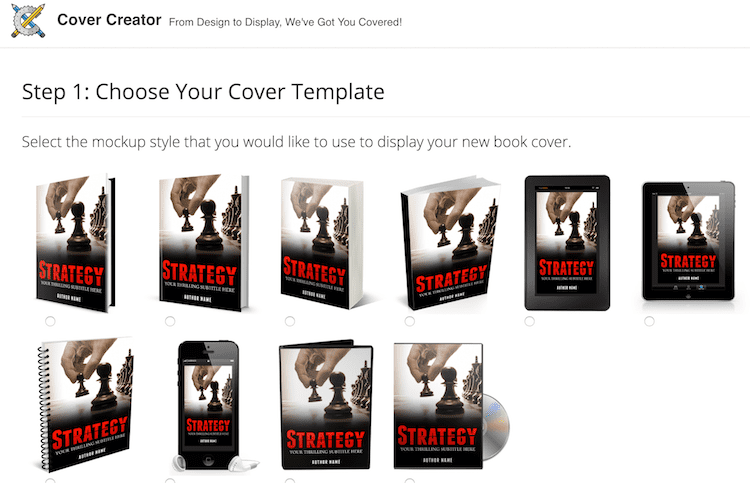 Once you are logged in, you can start hunting for a book cover template. 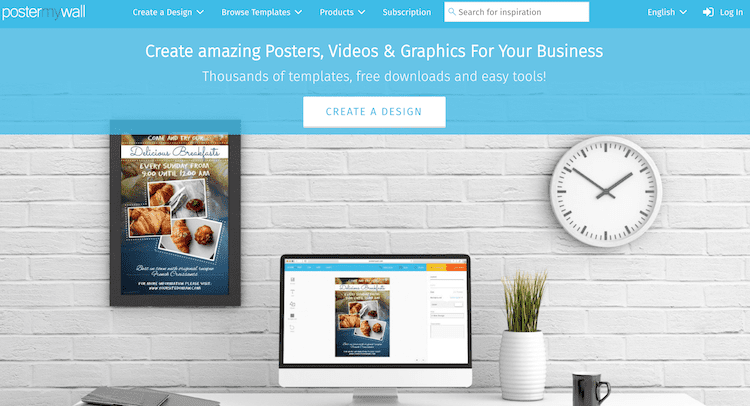 There are hundreds of free templates available, and some that are only available if you pay. Because it uses stock photos and images, you can’t change the background image. However, you have a wide range of fonts to style your title, author name and extra text. But for free, it doesn’t do a bad job at all in creating an acceptable cover in png, jpeg or pdf. While Cover Creator does have a cover design facility, its best feature is that it can produce a range of 3D versions of your book cover. All you need to do is upload your cover, and then download your 3D versions. 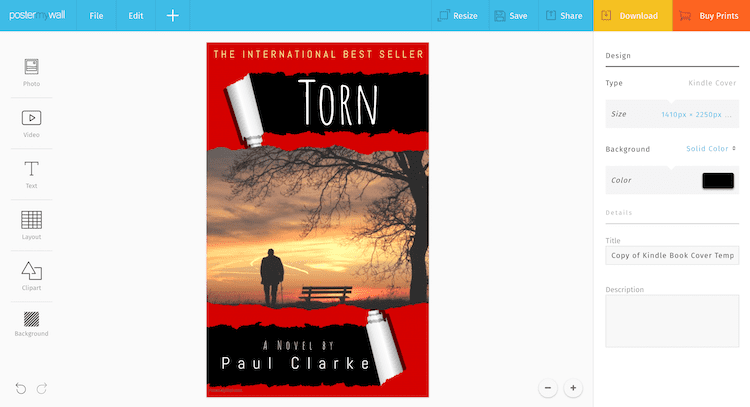 You can also choose a design type for ebooks that can produce your cover on a smartphone or tablet. It is a great tool to use to be able to promote your book cover in a much better way on social media and your website. You need to register with an email address, so perhaps expect a few emails and newsletters in your inbox in return for this free service. Snappa has a great range of features. The only restriction that is worth noting for the free version is that you are only allowed 5 downloads per month. This is not too terrible if you are using it to produce one book cover. The editor has a lot more functionality than many other free ebook cover makers, so that is a big advantage. Design Wizard is a free and premium design suite where you can create unique content in minutes. Every element in a selected template is editable. Change or upload backgrounds, images, videos and colours. Add a logo, change fonts or include a personalised caption. But there is also a wide range of free templates for book covers in different genres from romance to recipe books and in between. Design Wizard is a quick and easy solution for creating a Kindle ebook cover in just a few minutes. It is horses for courses. 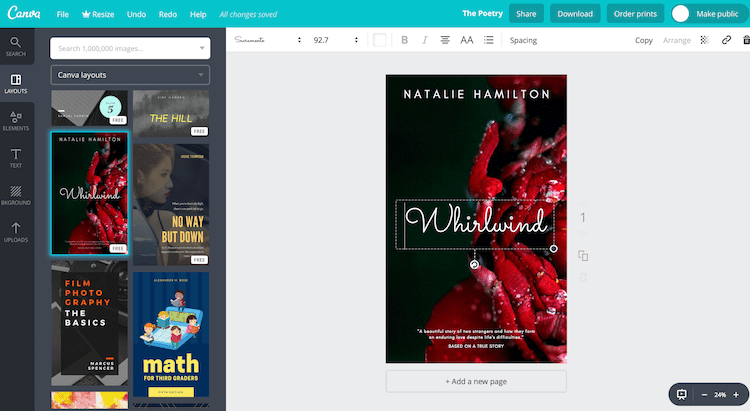 Sometimes you can produce a stunning book cover using free services, but you need to realise that a lot of other people are using these sites too. This means that you will never be able to create a truly unique book cover. Sure, the text will be different at the top and bottom, but there is usually little or no facility to manipulate the images. These services are free because they use stock photos, which are usually available for free on many other sites too. But if you are new to self-publishing and you are not sure if you will make enough money to recoup the cost of a professional cover, it might be worth trying a free ebook cover at first. You can always change your cover later if you change your mind and hire a professional cover designer. If you are writing self-help books, many of the free ebook covers can be styled to make them (almost) unique if you avoid using stock images in the background and stick to line graphics. Another consideration is that generally, the resolution of free covers is quite low at between 72 and 96 dpi. In this resolution range, these covers are definitely not suitable for use in creating and printing a paperback book cover. It would look awful. Even for an ebook cover, low-resolution images do not stand out as brilliantly on a screen as high-resolution. However, both Kindle and Apple accept 72 dpi, as long as your cover meets their minimum size and ratio requirements. As long as you understand the pros and cons of making your own free book covers with a free book cover maker and use them accordingly, they can be extremely useful, and of course, very economical. But remember that readers always judge a book by its cover. I didn’t know anything other than expecting to pay someone to create a cover for me. I want more freedom in creating my book’s cover than these business’ would give me. Thank you so much for the information . I didn’t know about these sites.